Through inquiry-based learning, students are able to experience and investigate the biogeochemical cycles. 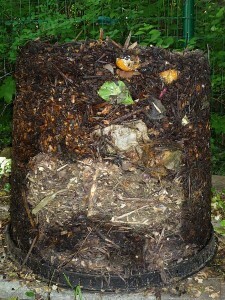 They utilize the engineering design process in order to design and construct compost bins. They also design a method for scientifically testing the validity of snack food companies’ advertisements that their packages are manufactured with 100% compostable materials. Throughout the composting process, students literally witness the interactions between abiotic and biotic resources within an ecosystem. They also discover the great diversity of organisms by analyzing both macroorganisms and microorganisms. Students observe the carbon and nitrogen cycles in action as decomposers convert the energy from rotting organic materials to rich humus which in turn produces abundant vegetation. Browse the Stem Curriculum archive. Grade Level: 6, 7, 8. Content Area: Expressions and Equations, Functions, Nature of Technology, Order and Organization, Statistics and Probability, Technology and Communication Applications, Technology and Society Interaction, The Number System, Writing. Industry: Agricultural Engineering. Bookmark the permalink.